Ask new workplace trainers how they feel before walking into a classroom and many will admit feeling anything but calm. In fact, most will talk about nerves. “A colony of butterflies takes up residence in my gut,” Wayne, a factory trainer told me on a recent train the trainer program. “I skip breakfast because of nerves,” Angie, a software instructor, shared. She elaborated. “I have no idea who will be engaged with the learning. Or who will be disruptive.” Wayne adds, “I worry about equipment not working when I demonstrate it in front of everyone. Most of their fears are driven by the worry that their class will not be delivered perfectly. Pre-class anxiety isn’t exclusive to new trainers. Seasoned trainers with years of experience also want to deliver that ‘perfect’ session. You know, polished presentations, nice slide decks and the like. So much so that many seasoned trainers tell me it’s tough to sleep the night before they deliver a class. Others follow superstitious routines to stay calm. Some even carry lucky charms in their pocket. Which begs the question, why do we feel so much pressure to be perfect? Some check slide decks a hundred times to be sure they’re perfect. Others rehearse word for word the lines they’ll use to introduce exercises. Or introduce a topic. Others carefully design wall posters and place them strategically around the room. Why do we worry so much about delivering the perfect performance? Or perhaps we should ask, why do we put so much pressure on ourselves to be perfect? The reality is that no training session is ever perfect. For all sorts of reasons. To start with, there’s no such thing as the perfect presentation or message. And science backs that claim up. And learning, no matter how well we plan or facilitate it, is never guaranteed. Even when we follow evidence-based practices. Yes, we can increase the likelihood people learn, but we can’t promise it. Sure, we can guess what the classroom experience will be. But we have no clue if folks will turn up late, leave early or have an administrator move our class to another classroom, halfway through the session. Yet all these things worry us. We worry about things we have little control over. Causing heartburn for trainers around the globe. I sometimes wonder if worrying is an occupational addiction. Of course, these things offer us no excuse to skip planning. They call us to be agile. Nor do they suggest we should be unprepared. They urge us to prepare for things we truly have control over. It’s easy to worry about the wrong things when training. Which I guess is why I wrote my latest book, Confessions of a Corporate Trainer (ATD Press). In my experience, coaching learning professionals and facilitating development programs for seasoned trainers around the globe, many trainers worry more about stuff they can’t control, than what they can. I know this makes sense – it’s human nature. But worrying about these things, which they can’t change, holds them back from really facilitating transformative learning. Worrying about stuff we can’t control in the classroom is an addiction that trainers need to break. But how can we rid ourselves of the worry addiction today? Scroll down for 6 steps to stop the addiction of worrying about things in the classroom we can’t control. 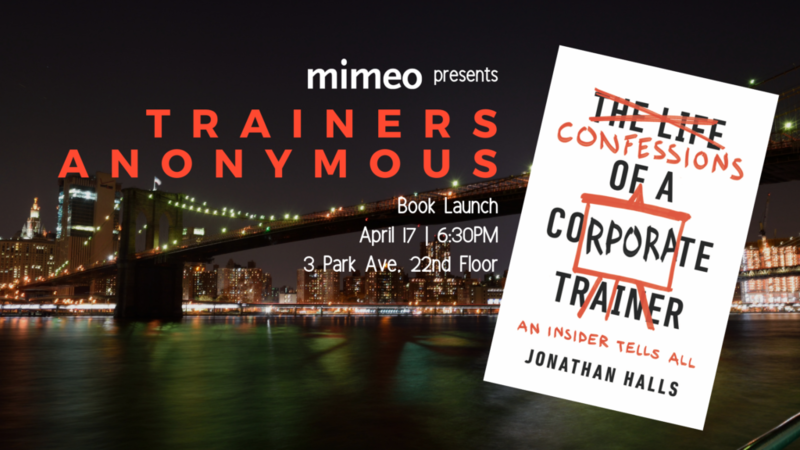 I dive into more depth in my book, Confessions of a Corporate Trainer. Admit that “crap happens” and that’s OK. Very often things don’t go as planned. So, don’t beat yourself up when something doesn’t happen as you planned. (Most likely the learner will have no idea it didn’t go your way, anyway.) Rooms change, people are late, and no matter how many times you check the equipment it still often fails. Some participants are grumpy, others don’t stop talking. Forget planning the “perfect workshop”. Instead, focus your energy on being flexible and agile to respond to things you can’t predict. It’s not about the presentation. Studies show that people forget 70% to 80% of what a presenter says and features in a slide deck. But so many trainers invest much of their energy in being slick out front and designing stylish PowerPoint slides. We need to remember that learning doesn’t happen on a slide deck or at the front of the classroom. So where should we focus our energy? That’s step 3. It’s about what the learner does, not you. Learners learn when THEY fire their neurons, not us. The more we say, the more they forget. But when learners talk about, explore and practice new material, that builds their learning. Oh, and by the way, the more activities you have learners do to build this learning, the more engaged they will be and … wait for it … the less likely to notice how many times you say “umm”. So, stop presenting and let the learners do the practical work of building their learning. Resources are important. What happens in the classroom is important. But what happens outside after learners leave your trusted care is even more That’s where learning is embedded. So, what resources can you share to help them remember key skills? Job aids? Refresher videos? Who can you network them with to support learning beyond the classroom? Step out of the way of the learner. Trainers often think they have all the solutions. Especially the SMEs turned trainers. But learners bring more to the classroom than many people think. They’re creative, resourceful and have skills and experience that make them the perfect people to build their learning. So, resist the urge to give learners the answer when they need to solve a problem or work something through. Instead, help them find the solution themselves. Reflect on how we can better serve. Some trainers think their job is like being a mini-keynote-speaker. It’s not. At a high level, our job is to help learners perform a new skill or an existing skill better. Rather than reflect on how we can do better, ask yourself how you can help learners be better by helping them more easily build learning and apply it in the workplace. Trainers can potentially have an enormous impact. They help learners build new or deepen existing skills. This helps them get better satisfaction in their jobs. Get promotions and bonuses. And when they’re more satisfied, they’re more engaged. That usually means the organization is more effective. And when the organization is more effective, the people it serves get a better deal. Not bad, huh? When you think of how trainers can impact other people, it’s pretty exciting. We just need to stop worrying about us and worry about helping them.